The Opsmen EARMOR M32H is based on the regular M32 MOD3, but redesigned to fit helmets. The M32H MOD3 comes in two versions: the M32H for ARC Helmet Rails/FAST Helmets, and the M32H for Team Wendy Helmets/EXFIL® Helmet Rails. Both models have MIL-STD 4 pin plugs for Push-To-Talk models (compatible with Nexus TP-120). 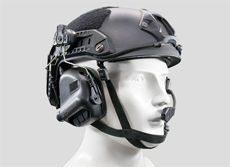 These ear muffs attach securely to the helmet and swing back out of the way when hearing protection is not needed. The detachable mic can be used on either side to comfortably suit both left- and right-handed users. Same dependable NRR 22 noise blocking as the regular headband earmuff M32 model. 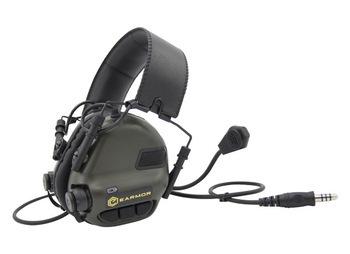 Opsmen Earmor M32 Tactical Electronic Communications Ear Muffs with boom mic and NEXUS TP-120 downlead are modeled after the Peltor ComTac headsets which were designed for military use. Opsmen M32 includes the critical capabilities of the ComTac, including rugged, durable, waterproof construction, dual mics for optimum situational awareness, user-selectable ambient volume amplification, internal volume limiter set at an OSHA compliant 82 dB, automatic noise compression of continuous or intermittent noises when needed, rugged, fully adjustable boom mic, and fixed downlead for connecting to a PTT adapter cable that then attaches to your two way radio. The reduced feature set of Opsmen Earmor M32 ear muffs means you get just the essential features you want and need in a high noise tactical communications headset, while enjoying a price that is hundreds of dollars less than top brands demand. Opsmen M32 connects via a fixed downlead and NEXUS TP-120 plug to a PTT cable that is fitted with the unique connector on your existing two way radio. The PTT cables are available for most two way radio models and must be purchased separately. For two way radios that have a single pin 2.5 mm connector, add the M51-M1 PTT adapter cable as an option when you order above. For other radios, please contact us with your radio brand and model and we will let you know which adapter cable you will need: info@earplugstore.com. Opsmen M32 ear muffs also amplify voices for easy, clear face to face communications while wearing the headset. Three user selectable amplification levels mean you can adjust the volume to your liking. With the M32 in place, you hear better than you can with the open ear, while remaining protected automatically, from noises greater than 82 dB. The internal volume limiter is set at 82 dB to comply with OSHA guidelines for use in regulated workplaces, insuring your hearing is always protected whether you are at work, in the home workshop, cutting firewood, at the firing range, or hunting in the field. And with an IPX-5 waterproof rating, 350 hour battery life using common AAA batteries, and the low price, you get a set of product features formerly only available in headsets costing hundreds more. NRR 22 for noise protection up to 107 dB. Rugged, durable construction suitable for both indoor and outdoor hard duty communications applications in industry, construction, tactical ops, and sport shooting. Fully adjustable, with padded, folding headband, ultra-soft ear pads, fully adjustable boom mic, and ergonomic design for all day comfort . Dual ambient mics for full, directional sound, and maximum situational awareness. User adjustable amplification of ambient sound lets you hear better with the muffs on than with the open ear, at the volume you prefer. Automatic sound compression of noises greater than 82 dB gives you protection from continuous or intermittent noises. IPX-5 Waterproof rated, so you don't have to worry about getting caught in the rain while hunting or working outdoors. NOTE: MT32 is compatible with Earmor or TCI/NEXUS PTT adapter cables only, and will not work with Element or ZTAC PTTs. Tested and approved in accordance with CE/RoSH/ANSI S3.19-1974/IPX-5 standards. 350 hour battery life, with automatic shutoff at 4 hours. Powered by two AAA batteries, not included. Box contents: one M32 ear muff and instructions.